Timber Jack is a game about a wood cutter called Jack, as you might’ve suspected. The game’s action takes place in the middle of a forest, where Jack lives and cuts trees, with the help of his trusted axe and with a chainsaw. The game’s action revolves around woodcutting, so most of the themed symbols have a connection with it. The game is offered by Microgaming, and it’s the only one that I’m aware of to come with this particular topic. Timber Jack’s layout is comprised of 5 reels and 30 win lines. 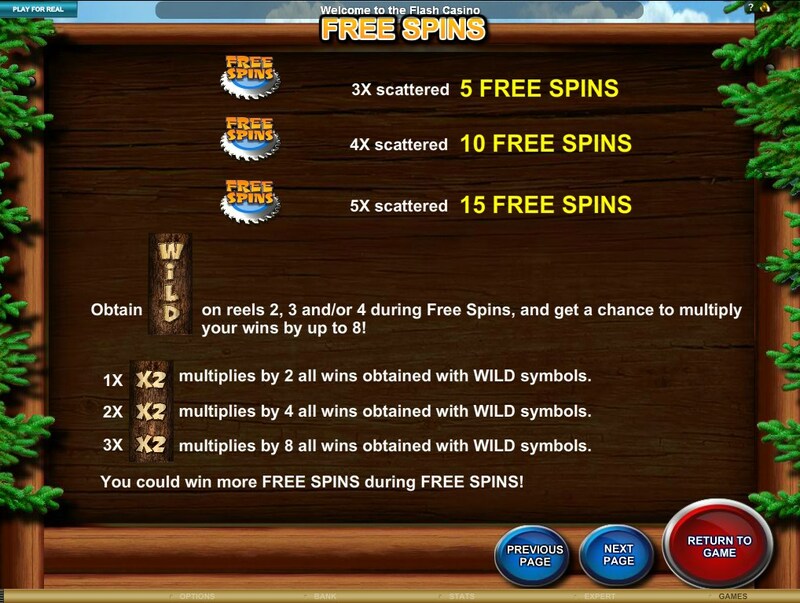 On them, wild symbols, scatters and free spins are provided, with multipliers of up to 8x also possible. As for the big prize, that’s clearly the most impressive part about this slot, going as high as $120,000. 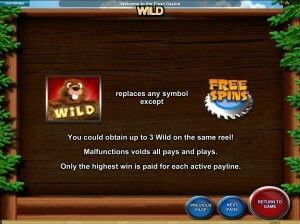 Wilds, multipliers, free spins and scatters are all available in Timber Jack, so you can expect some entertaining and profitable action from it. You’re going to see a Beaver symbol appearing on the reels from time to time. 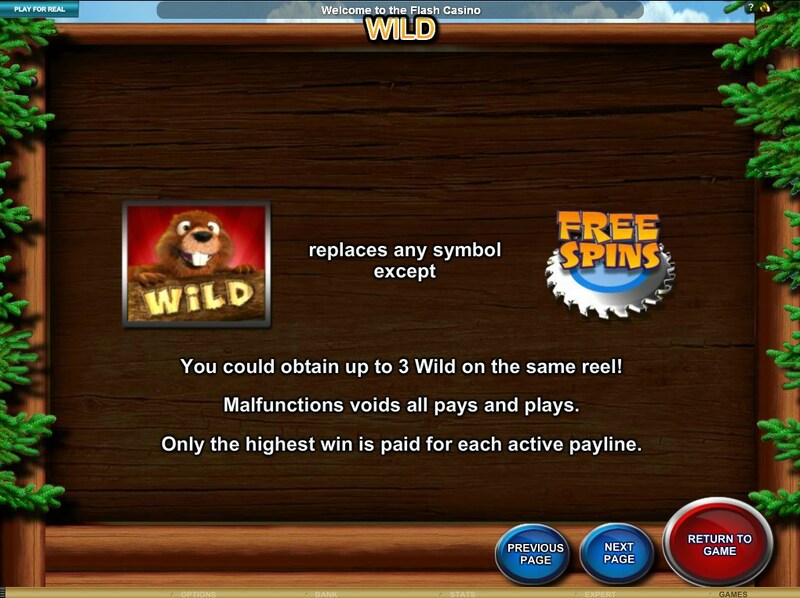 It’s the wild feature of Timber Jack, a symbol which can replace any other in the game, the one exception being the Free Spins Logo. Most of the time, the wild will substitute for any symbol, and the prizes will be the ones you would expect. 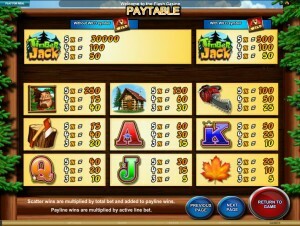 Something changes when it substitutes for the Timber Jack Logo, the one which offers the top jackpot. Without a wild, that symbol pays 30,000x. With the wild getting involved, the payout drops to just 500x for the same number of symbols. 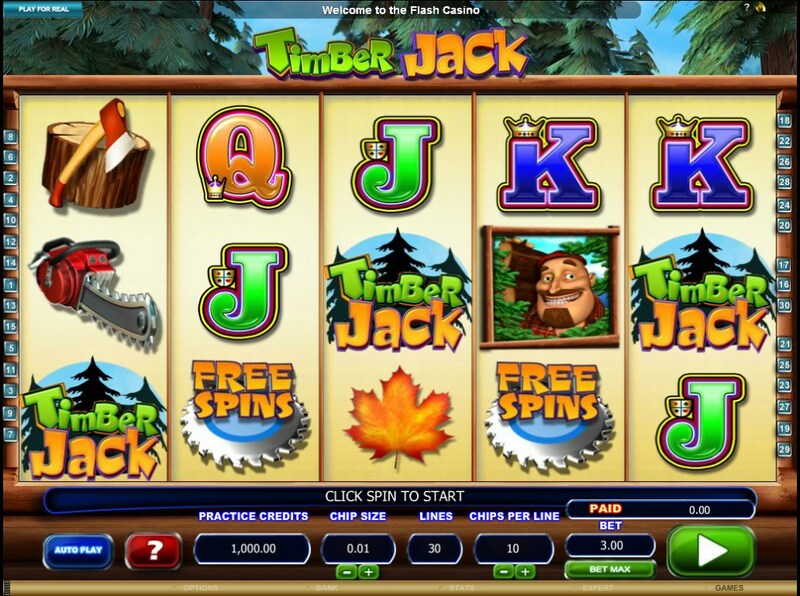 Another feature that you can expect to find in Timber Jack is the round of free spins. Triggered by three to five scattered symbols with the Free Spins Logo on them, you get between 5 and 15 rounds to go through. 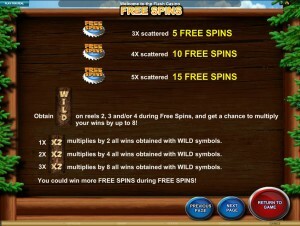 Special wild symbols can appear on the reels during the free spins, taking the form of tall logs with the word WILD on them. These wilds come with multipliers, which regular wilds don’t have. A single wild that participates in a combo will give you a 2x multiplier. With two wilds, the multiplier is 4x. When all three wilds of this type are part of a combo, the multiplier applied will be at 8x. 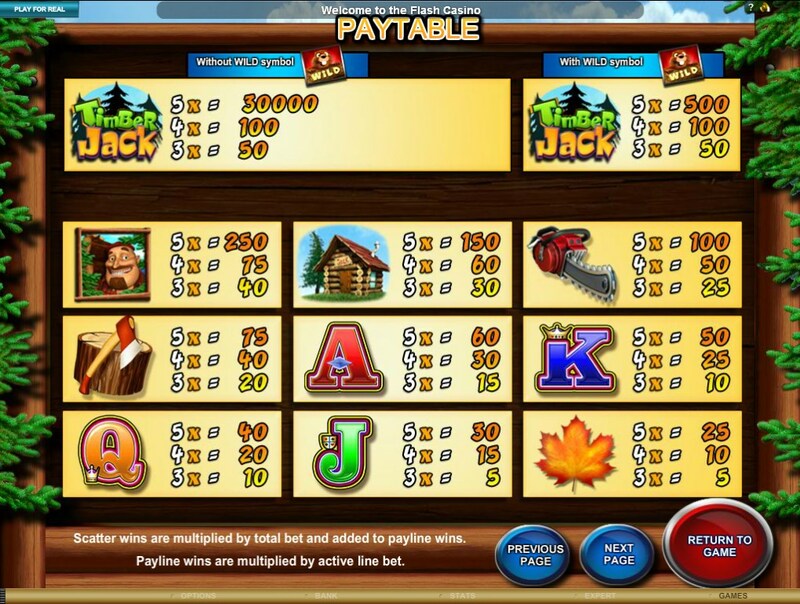 The line bet in Timber Jack will reach a $4 value, using 20 coins or less, with denominations which only reach $0.20. Since 30 lines are part of it, the maximum bet will be $120. The best possible reward gives the player 30,000 times the line bet, which means $120,000 in this case. The wild can’t contribute to it though, as that will reduce the prize to a very low value. The slot’s design is the typical one for a slot machine, mostly in the average department as far as looks are concerned. You have the standard mix of poker cards and themed symbols, the latter offering maple leaves, Jack himself, chainsaws and axes. You can see the forest that Jack is working on in the background, while the reels are of a light yellow and they are surrounded by borders made out of wood. Symbols: Timber Jack Logo (30,000x), Beaver (wild), Free Spins Blade (scatter), Jack (250x), Log Cabin (150x), Chainsaw (100x), Axe (75x), Ace (60x), King (50x), Queen (40x), Jack (30x) and Maple Leaf (25x). The game is definitely worth pursuing thanks to its features and top prize, but expect the rest of the combinations to pay quite a bit less. If you’re confident of your odds of getting the big payout, go for it. 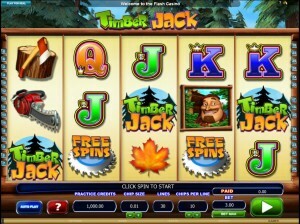 Timber Jack can be found at any Microgaming casino, where you get a chance to play it for real money or in free mode.